We have been collecting playmobil® since 1980, and never managed to restrain ourselves to some particular themes - love them all. The result? Since we enjoy doing a website, it seemed a natural choice to share the... obssession. It started out as playmoville, but it had to be renamed (and redesigned) to meet PLAYMOBIL® guidelines about fan sites. 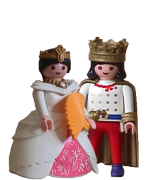 Well, first, our greatest thanks to playmobil® for making the little guys. After all, this site wouldn't exist if it weren't for them. Thanks also to everyone who contributed in any way to our evergrowing collection. Last, but not least we thank Rui and Bruno, for setting up stuff on the first run. This site is made for a resolution 1280 * 1024. Hopefully, it'll be ok in others. playkingdoms (formerly playmoville) is a tribute by playmobil® fans and collectors, not an official site, and it is not endorsed by PLAYMOBIL® (or anyone else for that matter). No copyright infringement is intended. This is a site made by adult fans and collectors, for adult fans and collectors, it does not aim to be a childrens' site. Children should be supervised by an adult while browsing this site (as any other). This web site is not owned, operated, sponsored or authorized by geobra Brandstätter GmbH & Co. KG. geobra Brandstätter GmbH & Co. KG does not endorse, and is not responsible for, this web site or any information or links contained herein; makes no express or implied warranties with regard to any information or links on this web site or any other linked web sites; and is not bound by any statements made on this web site, or by those who own or operate this web site. The trademarks PLAYMOBIL®, PLAYMOBIL® SYSTEM X, PLAYMOBIL® RC TRAIN and PLAYMOBIL® FUNPARK and the copyrighted images of PLAYMOBIL® products are the sole and exclusive property of geobra Brandstätter GmbH & Co. KG, which reserves all rights therein. We have started using Google Analytics in most sections of the site. Google Analytics is a web analytics tool that (hopefully) helps website owners understand how visitors engage with their website. Google Analytics collects information anonymously. It reports website trends without identifying individual visitors. We may collect personal identification information from Users whenever they interact with our Site. We may use "cookies" to enhance User experience. These are placed on the user's hard drive. Users may choose to disallow cookies. All info collected is used to help run or personalize the site. No information collected by playkingdoms itself is shared with companies. We do not sell, trade, or rent Users personal identification information to others. We may use and display information in the aggregate to understand how the site is used. By using this Site, you accept this policy. 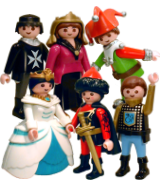 playkingdoms is a tribute by Playmobil® fans and collectors, not an official site, and it is not endorsed by Playmobil® (or anyone else for that matter). No copyright infringement is intended (see full disclaimer in the Castle).